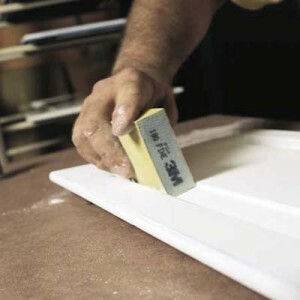 Here at Cabinet Refinishing Denver 303-573-6666 we always Allow the filled areas to dry, then use sandpaper to smooth out the surface of the cabinets. If your repainting project is just a facelift for the cabinets, you don’t need to sand and paint the inside of the cabinets, mask off the interiors with painters’ tape for a clean finish but make sure you use blue tape which is less adhesive and will not pull the finish paint when you have completed painting and sand only the front surfaces and visible edges of the cabinet face frames. Always Use a wood sanding block to prevent rounding over the wood edges. When sanding, there is no need to remove all of the old paint if it is sound and well adhered, just roughen the surface to provide the new paint to adhere with a firm, clean base for better adhesion. Cabinet Refinishing Denver always Pay particular attention to especially worn areas of old finish, which typically get the most use. Also be sure to sand over shiny areas to deglaze any remaining previous finish. Stubborn finishes may require rubbing with denatured alcohol and fine steel wool in order for best results. If the old paint is flaking off in places, the original finish did not adhere well to the wood surface. This is typically due to moisture or greasy residue getting under the paint layer or into the wood itself, which can be expected in kitchens. Cabinet Refinishing Denver wants you to always Make sure and wipe down with a denatured alcohol prior to sanding and Sand these areas to bare wood and spot-prime with a stain-killing primer/sealer before repainting. Wherever you sand down to bare wood, try to blend or “feather” the edges where the old paint meets the wood so the new paint will lay flat, and the paint edges will not be visible or reveal through the new finish. Thoroughly blow off the sanding dust from all surfaces. If you have a pneumatic air compressor, use high-pressure air to blow the dust out of crevices or molding details. Wipe down the areas to be painted with a tack cloth to pick up any remaining sanding residue. So if you’re looking for the right company to get your cabinet paint it right the first time give us a call here at cabinet refinishing Denver and we will get back to you soon as possible thank you. Tags: cabinet refinish in Castle Rock, cabinet refinishing Adams County, cabinet refinishing Aurora co., cabinet refinishing Boulder co., cabinet refinishing Castle Pines Colorado, cabinet refinishing centennial co., cabinet refinishing Denver, cabinet refinishing Douglas County, cabinet refinishing Highlands Ranch, cabinet refinishing Jefferson County, cabinet refinishing Lakewood co., cabinet refinishing Larkspur, cabinet refinishing Littleton co., cabinet refinishing Parker, kitchen cabinet painters, kitchen cabinet painting, kitchen cabinet refinishing, painting cabinets Littleton Colorado, painting kitchen cabinets Aurora, painting kitchen cabinets Boulder, painting kitchen cabinets Castle Rock, painting kitchen cabinets Centennial Colorado, painting kitchen cabinets Colorado, painting kitchen cabinets Denver, painting kitchen cabinets Douglas County, painting kitchen cabinets Highlands Ranch, painting kitchen cabinets Jefferson County, painting kitchen cabinets Lakewood co., painting kitchen cabinets painting kitchen cabinets Adams County, painting kitchen cabinets Parker, painting kitchen cabinets Thornton co.